From left: Mark McNulty with one-year-old daughter, Molly, and Wen Farina with 10-month-old daughter, Elena, at Castle Island. 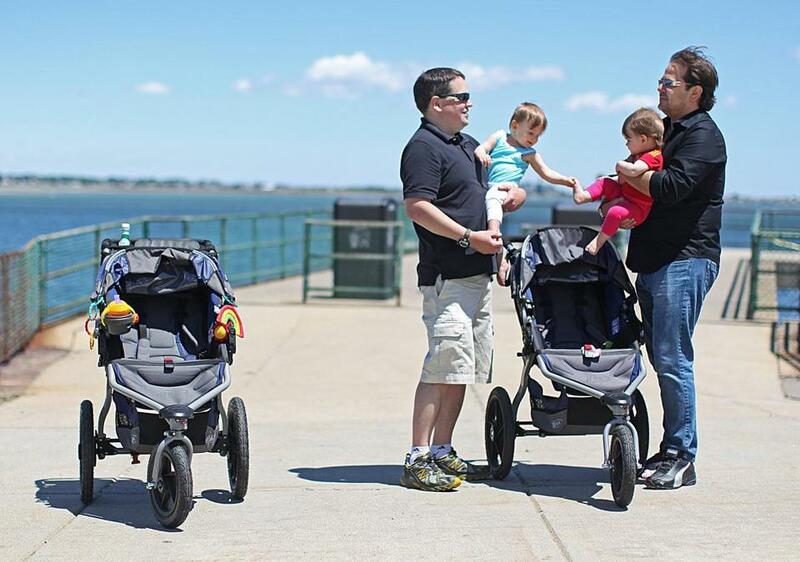 Two dads stood talking about jobs, fatherhood, and life in general, each holding an infant daughter on a recent windy, warm day at Castle Island in South Boston. The babies reached out for each other and latched onto whatever was in their grasp. A trio of other men, with kids in arms or in tow, joined them, introduced themselves, and tried to join the group, which was being pulled in various directions by the wiggling and whines of little ones desperate to run and play out of their fathers’ reach. Scenes like this are becoming more common at playgrounds, museums, parks, malls, and grocery stores across the nation. Because of a series of cultural and economic shifts, increasing numbers of fathers are taking greater responsibility for child care and are banding together in organized groups like the Boston Dads Group to share advice, commiserate, and socialize. John Gonzales and his daughter attend a Boston Dads Group meet-up that allows fathers — and their kids — time to hang out together. According to Mahaffey, the group includes single fathers, some who work from home, others who are new to town and looking to meet people, working dads who want to meet up with other dads and their kids, and full-time stay-at-home dads, who are perhaps the fastest growing subgroup. According to the Pew Research Center’s Social and Demographic Research Project, there are more than two million fathers nationwide who do not work outside the home, nearly double the number since 1989. The numbers show that the 2007-2009 recession caused a rise in unemployment, contributing to the number of dads staying home, along with illness or disability. Another contributing factor involves the rise of women in higher-paying professions and changes in cultural attitudes toward men staying at home to raise children. 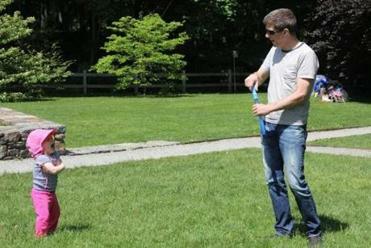 In fact, the Pew research showed nearly a quarter of stay-at-home dads say they do so by choice. Karen Kramer, an assistant professor of family studies at the University of Illinois, agrees. “This parenting trend is definitely driven by the family’s economic situation and due to a change in power within a husband and wife relationship,” she said. “In the earlier days, most [stay-at-home dads] stated they stayed home because of loss of job or disability. The numbers are changing,’’ with increasing numbers of men opting to remain home. While it’s becoming more accepted, becoming a stay-at-home dad still is not an easy decision, said Boston Dads cofounder Mark McNulty. He said it seems to be more common with older first-time parents who are more financially established and better prepared for the lifestyle change. Groups like Boston Dads are important for the same reasons moms seek out playgroups and various meet-ups, said Kramer. It can get monotonous being at home with the children, so the dads want to get out and be with other dads, she said. Both relatively new first-time fathers, Mahaffey and McNulty shared a desire to connect with other dads. Last year McNulty formed a small group on the South Shore and began looking for ways to draw more members in Greater Boston. Mahaffey was searching for a local group and came across the New York City Dads Group through a website called Meet up.com. The two men had never met and each reached out to Lance Somerfeld and Matt Schneider, founders of New York City Dads, seeking advice. McNulty said growth was a little slow at first, but through social media, flyer distribution, and speaking with local organizations, word spread and membership steadily increased. “It’s been very exciting to see the group take off like this,” he said. Greer, 41, moved his family from Nashville when his wife, Victoria, took a job as assistant superintendent of schools in Cambridge. Greer, an insurance claims adjuster, got his company to transfer him to the area. But he and his wife quickly realized that with the higher cost of living in Massachusetts the additional expense of paying a nanny wasn’t cost effective, so he and his wife decided he would stay home with the boys. Greer said he used to get some looks from the moms groups, so he feels more comfortable in the company of the dads and their children. The White House has taken note of the trend, hosting its first-ever Summit on Working Families last month with a focus on roles of fathers. Mahaffey attended along with dads from across the country. “It was a monumental event because the White House acknowledged the important role of fathers,” said Mahaffey, the father of a 2-year-old daughter and a newborn. One of the speakers at the conference, which looked at issues like workplace flexibility and parental rights, was New York Mets second baseman Daniel Murphy, who received criticism from a few members of the sports media for taking a contractually guaranteed parental leave, missing two games, including opening day, to be there for the birth of his first child. Mahaffey said the summit discussed the need for gender-neutral paid time off after the birth of a baby. “The US is far behind every other developed nation in this area. Hopefully with summits such as this we can begin to change that.” Currently only California, New Jersey, and Rhode Island offer family leave, which guarantees unpaid time off for the birth or adoption of a child or to care for a close family member who is ill or elderly. Essentially, Mahaffey said, full-time dads who also have full or part-time jobs face the same pressures working women have faced for generations, only there are fewer models for them. At least for now. Mahaffey works full time running Tangible Transmedia, his home-based media production company, writes a blog called “Becoming a Ninja: Frontlines of Fatherhood,” and teaches parenting classes while his wife works full time in financial services. The couple relies on babysitters and family to fill gaps when Mahaffey can’t be around.